Last month, our Executive Director came to us with fabulous news. We were just approved to coordinate a program on behalf of the RIC’s in the ONE Network that would provide up to $30,000 in seed funding for start-up enterprises. At first, I thought “Yay! New program!” and assumed that would be around the limit of my involvement. As you can probably guess, I was wrong. With the weeks leading up to the official program launch, newly dubbed VentureStart, I found myself getting more and more intrigued by the details of the program. It quickly became clear that this was a major boost for serious entrepreneurs, who are willing to commit significantly to developing their business. VentureStart is open to start-ups in Southern Ontario, founded by graduates of a science, technology, engineering or mathematics program. The first phase pays for half the cost of entrepreneurial training to start-up owners. For those start-ups who successfully make it to the business launch phase, they will then be given access to one-on-one mentorship, provided by the RIC Centre and its Ontario Network of Excellence partners. Oh, did I forget to mention the $30,000? Yeah, VentureStart provides that in the second phase too. But it’s not a direct grant; the entrepreneurs must also invest a sum equal to what they are granted into their own business. This will effectively super-charge a startup with a rocket booster that will instantly change its $30,000 seed capital to $60,000. This level of investment often means the difference between success and failure for a startup. To me, this is where we see the value of VentureStart. 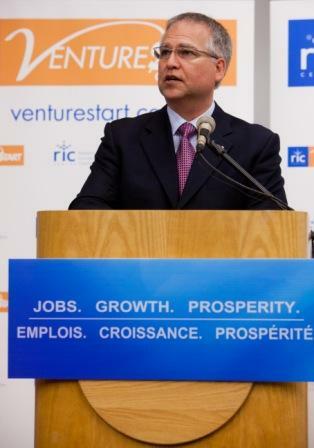 VentureStart is only going to invest in entrepreneurs that will be serious about their business and serious about Southern Ontario’s economic growth. Fly-by-nights need not apply. Neil is the business analyst at the RIC Centre. He works with entrepreneurs in residence and RIC clients on a regular basis. He is currently pursuing an M.B.A from the DeGroote School of business at McMaster University.